Amazon will soon get rid of every Nest product on its site. Before that happens, however, you have a great opportunity to save a big chunk of change on the company’s best and perhaps most popular product, the Nest Learning Thermostat. The thermostat that started it all is now in its third generation, and it’s still the best smart thermostat on the market by a wide margin. It’s also quite expensive though, which is why the current sale on Amazon is so great. 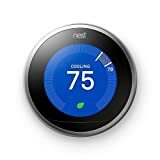 One seller on the site is currently offering the Nest Learning Thermostat for just $209.95, which is the gadget’s lowest price of the year so far by a healthy margin. There’s no telling how much inventory this seller has though, so grab one while you still can. UPDATE: The seller with thermostats available for $210 has sold out, but there are still units available with slightly smaller discounts.